The Scioto River is predicted to crest above flood stage today, which is expected to result in minor flooding. The National Weather Service on Tuesday put into effect a flood warning for the Scioto River at Piketon. The warning stays in effect until late tonight. According to the weather service in Wilmington, the Scioto River had reached 11.8 feet at 10 a.m. Tuesday. Flood stage is considered 20 feet, and the weather service said minor flooding is in the forecast. The river is expected to rise above flood stage by early this afternoon, and continue to rise to near 21.6 feet by early Thursday morning. The river was predicted to drop below flood stage before midnight Thursday. 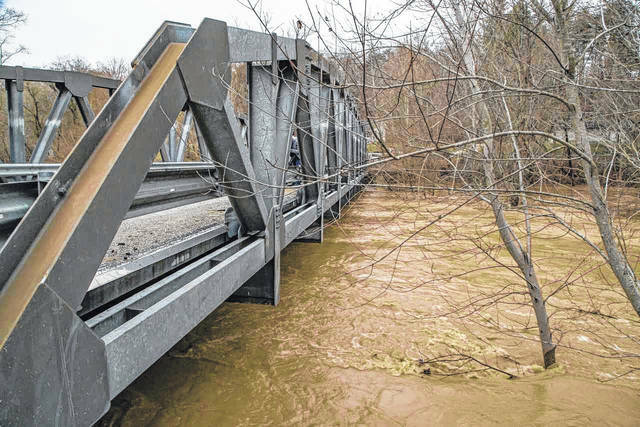 As of Tuesday afternoon, a spokesperson for the Pike County Sheriff’s Office, who declined to be identified, said some minor flooding already had struck the area. State Route 124 was closed because of water at about 1 p.m. The spokesperson stated engineers were predicting the road would be open late Tuesday evening. No other issues were reported. Elsewhere, the weather service issued what it called a “hazardous weather outlook” for several areas, including Scioto County. On Tuesday afternoon, the weather service predicted strong wind gusts of up to 35 mph were possible into late Tuesday. The weather service added that a line of thunderstorms could well accompany a cold front as it crossed east through the region Tuesday evening. Apparently, as a further precaution, the weather service put a tornado watch in effect for Portsmouth until 8 p.m. Tuesday. The Wilmington office of the National Weather Service serves Portsmouth and the surrounding county. A Wilmington meteorologist predicted dry weather after Tuesday night, with temperatures reaching between 30 and 50 degrees. He predicted a chance of showers on Saturday and Sunday, with temperatures as low as the 30s. However, he also added there was almost no chance of snow. Because of recent nasty weather, The Daily Times has contacted the weather service for forecasts several times in the last month or so. On one occasion, a meteorologist predicted one more round of snow, with no further white stuff falling this spring. It snowed two days later. On another occasion, the weather service predicted a dry weekend. By Friday of that week, there was plenty of rain. On Tuesday, a meteorologist said his office was too busy for him to go into why forecasts can sometimes seem largely inaccurate. https://www.portsmouth-dailytimes.com/wp-content/uploads/sites/28/2018/04/web1_Rain.jpgThe Scioto River is predicted to crest above flood stage today, which is expected to result in minor flooding.